According to my calculations, Ontario's economy has improved. Here's how I know: our call volume has rebounded like a kangaroo on a trampoline, which means that people are travelling, which means they have money, which means they have jobs. Pretty good, eh? Forget those costly economics reports and employment rate analyses. Just ask the Upsala fire chief how many times he rolled a truck this week, and you'll get a pretty good handle on the health of the nation. Of course the increase in calls could be connected to the festive season. Not that people intentionally drive crazier during the holidays . . . there's just more of them out there, so there are more chances that people will do crazy things. It's all about statistics. I'm sure a report exists somewhere that says, "Ontario's driver insanity rate is 17.2 per 100,000," (or something like that). And chances are, those 17.2 people are going to drive through Upsala some time during the month of December. And at least a few of them will go in the ditch, or roll over, or hit a moose on the stretch between Raith and English River. 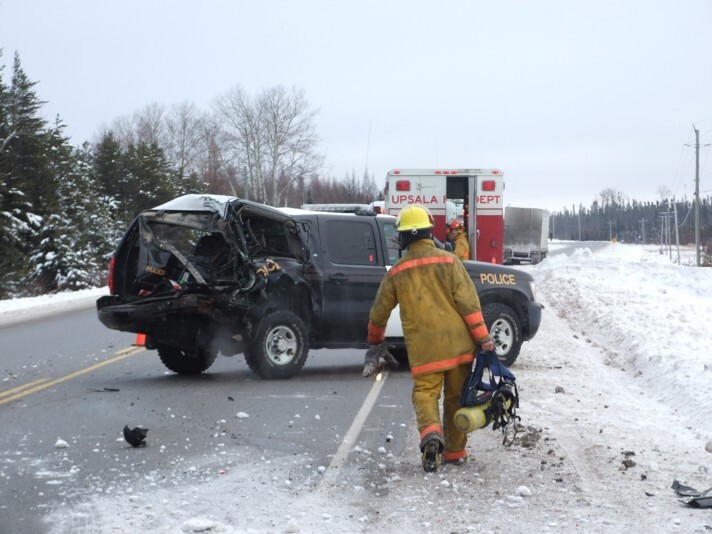 Speaking of vehicle crashes, here's a couple shots of the incident that that I mentioned in my last post. The original incident was a tractor trailer fire. 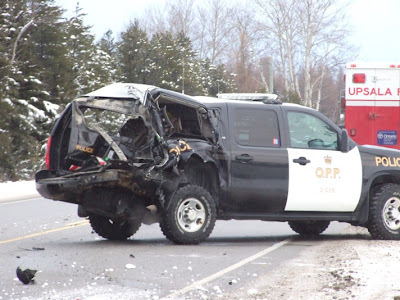 An OPP officer was helping out, and had just put an empty extinguisher in the back of his cruiser when another tractor trailer rammed it from behind. The officer got out of the way, but the cruiser was totalled. We were responding to the same tractor trailer fire, and arrived shortly after the mishap. I hate to say it, but I'm glad we didn't arrive five minutes sooner. The chances of someone getting hurt increase with the number of people at the scene. It's all about statistics. Speaking of injuries, two Chicago firefighters died on Wednesday in a building collapse. Definitely the dark side of the holidays. On another gloomy note, another volunteer fire department in northern Alberta has suspended service on Highway 63. The Alberta government seems to think it's helping the problem, but these folks need more than just advice about recruitment strategy. Someday when I'm King . . .
On a happier, you-can-help-save-the-world theme, let me remind you to vote for Horsefly Fire Department and help them win a Pepsi grant for a new fire hall. They've moved up to 14th place, and December 31 is looming. After you're done there, go to the CAFC site and put in a good word for volunteer firefighters. It only takes a minute.